← Pumpin’ Iron – And Your Neurons Too! As a former fitness trainer, and as life-long advocate for diet and fitness in general I have frequently heard this lament from those trying to shed the pounds. To these individuals the prescribed regimen for meeting their goals is failing – yet have they really stuck to the program? Unfortunately, as any shrink will tell you, a bad habit has a host of subtle tricks for maintaining it’s existence. One of it’s most powerful weapons in keeping you hopelessly fat is the awesome power of self delusion. Take a step back from yourself – envision yourself hovering over the dinner table watching yourself detachedly like those on the operating table in a near-death experience. What exactly are you eating? 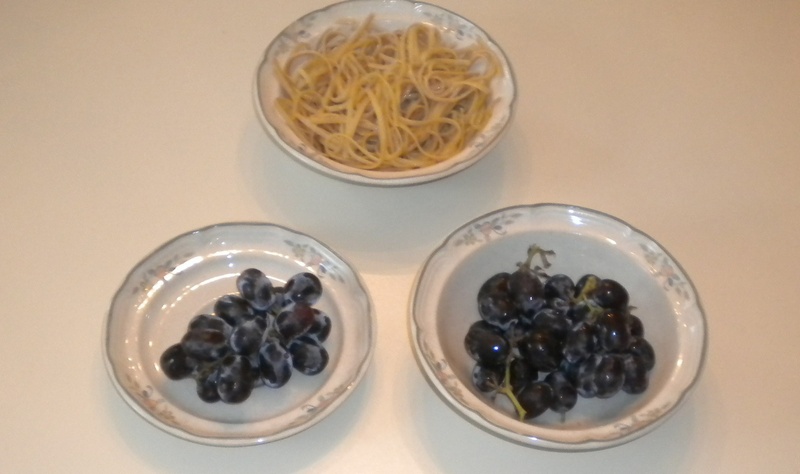 In the picture above you see two bowls of grapes. The one on the left has the recommended quantity for one serving (about 17 grapes). The one on the right has “oh, a few more than that”, at least thats how it looks. The reality – it has exactly twice as much. And double the calories. But does your dietary regimen say to have two snacks that hour? You can see how easy it is to fool ourselves. Another example: A recommended serving of pasta is about a cup, or about the size in your plate of your fist. Now if you hold both of your hands together in a double fist it only seems like a little more right? The serving of pasta in the picture is actually about two and a half cups, but I see many people putting that much or more on their plate. Its the simple law of physiques – er physics, and denial changes nothing. Whats the solution? If you are serious about losing weight you have to be a bit tough with yourself in the beginning. Take the time to actually count the food, or measure your servings religiously for the first few weeks at least. By then you will have developed the habit of dishing out accurate helpings – and seeing significant results for your efforts. This entry was posted in Diet and tagged diet, dieting, food, motivation, snacks, weight loss. Bookmark the permalink.